Can u make a sweet at home in 5 mins time.This could be one creative option for the sweet. It tastes so Good and U barely need 5-6 mins to give it a try. Break the noodles into 4-5 portions. 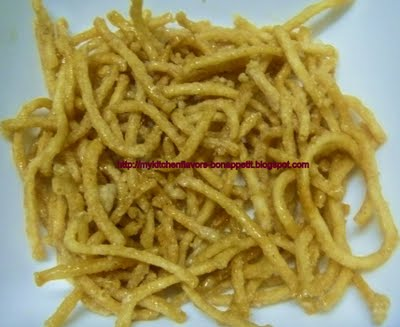 Deep-fry the noodles using refined oil till it begins to turn golden brown each portion separately.When the noodles begin to change colour,turn off the flame.Wipe out excess oil using a tissue paper. Heat a thick bottomed kadai and caramalise the sugar (without adding anything). When the sugar begins to melt, just add the fried noodles and and stir the noodles for a min or more till the sugar gets coated evenly. Don't repeat it over 2 mins(it turns lil bitter) after adding the fried noodles. Hi ! Christy ...A very Innovative Quick Fix . Thank U .